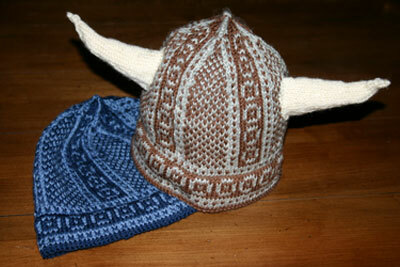 Waaaaay back in ’06, I made these Viking Hats for my dear son #2, Alex. Back then, to the casual observer, Alex was a mild-mannered, studious sort; hence the relatively tame, blue version. But even in those early years, those of us who knew Alex well hailed him more appropriately as “Alex the Barbarian”; hence, the horned version. If you’re interested in the new PDF, you can find it here, through Ravelry. It’s also available through Ravelry’s in-store LYS program. Here’s the Ravelry project page. ** Yes, you know I love Heilo, but of course the Barbarian’s hats were made in superwash Falk – are you kidding?!?!?! This entry was posted in Knitting, Mary Ann's Designs, Norwegian Knitting, Uncategorized and tagged Dale of Norway, fair isle, fair isle hat, funny hat, hat, horns, knit, Norwegian knitting, ski hat, stranded knitting, Viking, viking hat. Bookmark the permalink.